Here are 10 reasons why you need to read this book besides the obvious: it’s a 27-Time #1 Bestseller! Check it out i Amazon HERE. 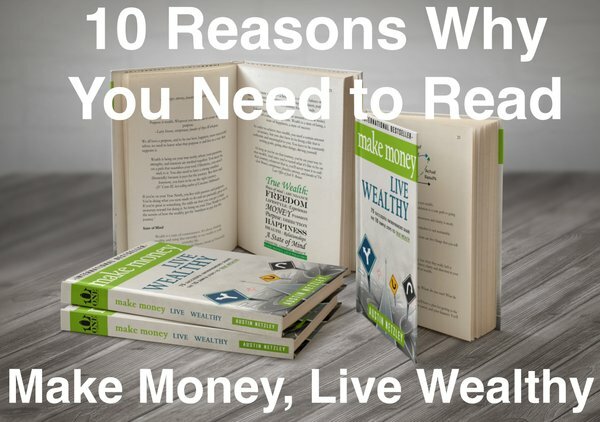 In one sentence, this book is all about what true wealth is and how to obtain it. The first part, what true wealth is, should be common knowledge, but it’s not! The dictionary defines wealth as ‘a large amount of money and possessions’… but when you ask someone who is actually wealthy what wealth is, you get a completely different answer. This book lays out their definitions and the common elements among them. This is important so that you don’t chase many dead-end traps, and can get to where you really want to go much, much faster. It doesn’t matter who you are, where you’re from, what education level you have, or where you’re at in life right now – you can become massively wealthy. The experts highlighted in this book have overcome massive debt (countless experts had more than $75k in bad debt), troubles (Matt McWilliams faced 42 years in prison), and even death (Hal Elrod was considered dead for 6 minutes) to achieve some unbelievable things. David Wood went from essentially broke to owning an island in shortly over a decade. Trevor Blake, born into poverty, decided he wanted to be an entrepreneur in his 40’s and he quickly built and sold not one, but two businesses over $100,000,000 each. This book, which uses hundreds of quotes from the experts to drive the messages, should be motivation to show you what’s possible, as well as how to do it. Use that motivation to get into action! Where do you start? What priorities do you need to focus on? What things are missing in your life? Wealth can be complex, but it doesn’t have to be. Let this book be your roadmap and highlight the important things to focus on. The way to achieve anything great is to simplify the process, and take one small step at a time. This book will show you how. Is it your mindset? Your network? After reading this book, you should have much better awareness for what your situation is, and what you need to correct. Fill in the missing pieces, and you’ll be on your way to wealth. If you read one chapter, read chapter 2. It is all about the mindset. At the heart of wealth, success, or anything else is one simple thing: the mindset. The rich think, act and believe differently. Think like them, get out of your own way, and you are on your way to massive wealth. Nothing is more important than mastering the mindset. If you want to build a massive skyscraper, you need a strong foundation. You need to do a few of the boring but necessary things so that you can take on more risk and be able to handle the unexpected. You want to learn the basic fundamentals of wealth, and also make things easy on yourself. Mastering finances isn’t hard… if you make it easy on yourself. Automation and a strong plan can give you the strong core from which you can both make – and keep – a massive fund with. There are several things that the wealthy do differently that help separate them from the pack – from taking advantage of certain tax benefits available to them, to how they view risk – if you want to really build a massive fund, then it takes doing just a few things that aren’t common knowledge. This section reveals some of the surprising yet powerful secrets of the rich. That is someone who has been a professional for years and years. Success breeds success. Use the wisdom of 75 successful people to guide you to all of your dreams. There are many traits and a few skills that the wealthy exhibit. Some of them are absolutely critical, and they’ll definitely make your journey to wealth much, much easier. With your career, look at it as a portfolio. You often need to add different experiences and skill sets to get to where you ultimately want to go. Learn what a few of those necessary skills are, and be sure to check them off. You’ll be more than happy you did. Ultimately, this book is a success if you get on your path towards wealth. Once you do, you won’t get off of it. Once you get a taste of living your dream life, you won’t know any other way. The hardest part is just getting started. This book will help you identify where you’re stuck, what you need, and what you need to do to get into motion. Once you do, you’ll start to build momentum, one piece at a time. Then, you’re unstoppable. Check out the book in Amazon HERE! Sign up for the free book guide videos & resources HERE! We all have troubles in our life… Financial troubles, relationship troubles, job troubles, etc. It isn’t always easy, but no matter how large or small the challenge is, there is a formula to turn it around. Dr. Dennis Cummins came on the YoPro Wealth podcast to tell us what that formula is. Dennis is the author of the soon-to-be bestseller, Turning Terrible into Terrific: Changing Your Life at the Speed of Thought. The first step to take to turn any situation around. What you need to clarify to make sure you’re headed down the right path. The 5 pieces of financial freedom. How to use visualization to change your habits. What you need to know about your thoughts and your habits. The one question you need to ask yourself with any decision. The best vehicle to help create financial freedom for anybody. .
And so is today’s guest. After facing 42 years in prison, being fired 4x, seeing 2 of his companies fail… he found out that he was a world-changer. Matt McWilliams of mattmcwilliams.com is this person, and he shares his story and lessons with YoPro Wealth. How to overcome massive challenges. How to be bold and take risks. What to learn from failures. Why you should charge more money. Why you should focus on gratitude. The risk of lifestyle inflation. How many positive things you must say. Do you know what you need to do to retire? Well, in this podcast we’ll talk about that and so much more. Ryan Michler of Cittica Financial is today’s guest, and he brings a great view on the different stages of wealth, and what you need to do in each stage to really make your wealth excel to the next level. The 5 stages of wealth. How to build your base with wealth. Why you need good protection. The race car and what it means to your investments. The 3 things that you need to take responsibility of. How you can start building your legacy now. The keys to successful investing. How you can build as much wealth as you possibly want.